Try to prevent dental injuries with a mouthguard. A custom mouthguard (made by the dentist) offers the best protection against tooth fracture, tooth loss, and concussions. A boil-and-bite mouthguard is another great alternative if a custom mouthguard is not available. 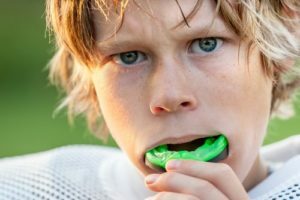 Children participating in high risk sports and/or activities should wear a mouthguard during all practices and games. High-risk sports include basketball, field hockey, ice hockey, lacrosse, football, wrestling, rugby, and basketball. If a tooth is knocked loose or wiggly, it may or may not need immediate attention. 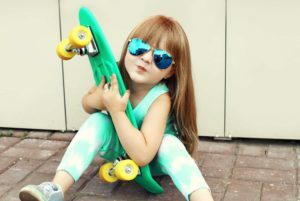 If the movement is minimal and your child can bite into a normal position, eat soft foods and provide over-the-counter pain medication as needed. Contact your pediatric dentist for a follow-up appointment. If the movement is substantial and/or your child cannot close normally because the tooth is out of position, contact your pediatric dentist for immediate attention. If a tooth is fractured, contact your dentist. It may need immediate treatment depending upon the size and location. If possible, locate the fractured piece of tooth since your dentist may be able to reattach the broken piece. Place the broken piece in a glass of milk. Avoid really hot/cold foods and drinks, as the tooth may be very sensitive to temperature changes. Also avoid biting into hard foods. If a baby tooth is knocked out, rinse the mouth with clean water. Apply a cold compress to the area to help control bleeding and reduce any swelling. Place the tooth under your child’s pillow for the tooth fairy (it cannot be replaced), and contact your pediatric dentist. If you cannot locate the missing tooth, it’s possible the tooth was pushed up and into the gums. A follow-up examination and x-rays are often needed to locate the missing tooth and asses for other possible injuries. If a permanent tooth is knocked out, locate the tooth immediately. Pick up the tooth by the crown (white portion) and gently rinse with clean water for 10 seconds if the tooth is visibly dirty. If the tooth does not appear dirty, do not rinse. Replant the tooth into the socket. 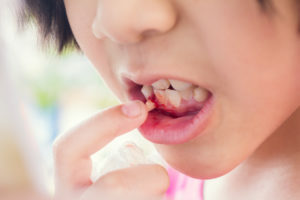 Gently bite on a washcloth to help seat the tooth and hold in position. If you are uncomfortable replanting the tooth, place the tooth in a glass of milk or Save-A-Tooth solution. Contact your pediatric dentist immediately, this is a true emergency and time is critical! It’s important to know your dentist’s emergency contact number. We recommend hanging it on the refrigerator so it’s easily accessible in an emergency. Patients of Hamilton County Pediatric Dentistry have 24-hours a day, 7 days a week access to emergency care!